Highly efficient microfiber hard floor cleaning system cleans more square feet in less time. Lightweight system weighs only 4 lbs. when fully loaded with solution. High-capacity on-board fluid reservoir holds up to 21 oz., enough to clean up to 850 sq. ft. Superior germ removing microfiber is proven to remove 99.9% of microbes. Innovative, double-sided frame cleans twice the area with one mop. 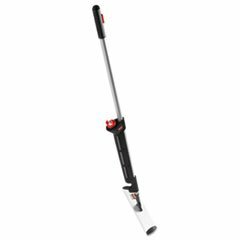 Quick connect system works with Rubbermaid® Commercial telescoping handles (sold separately) for dust mopping use. Application: Floors; Mop Head Size: 18"; Handle Length: 55.4"; Handle Color: Black/Silver. If you have any questions about this product by RCP1863884, contact us by completing and submitting the form below. If you are looking for a specif part number, please include it with your message.